What Do Space Shuttles and Cancer Have in Common? A glimpse into stereotactic radiosurgery for lung cancer spread to the brain. I am not new to the world of cancer. I survived childhood osteogenic sarcoma, and have been living with stage 4 non-small cell lung cancer for two and a half years. I have had my share of chemotherapy drugs (adriamycin, ifosfamide, methotrexate, carboplatin, Alimta, Avastin), I have had several radical surgeries to save my right arm, and I have been benefitting from a cutting edge targeted therapy. But, with all of these treatments, the one I have never experienced is radiation. Until this past Monday, that is. As I wrote about in "The Other Shoe," my regularly scheduled MRI showed that while the targeted medicine I take for my ROS1 mutation is doing a fabulous job controlling the cancer in my body, some sneaky cancer cells made it into my brain. So, on Monday, I had the super fun experience of stereotactic radiotherapy. They numbed my scalp with lots of lidocaine and proceeded to clamp what my husband described as "skateboard hardware" onto my head. Seriously, it looks like stuff you would find in your basement workshop. 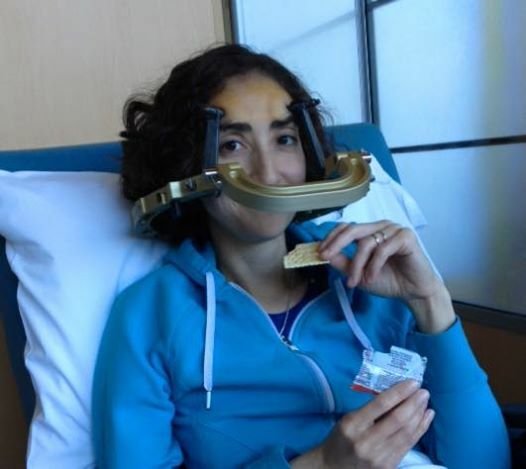 Next, they took me to have a CT of my head, with my fancy headgear clamped into the machine so that they could plan out exactly how my head would match up with their lasers. By now, it was about 9:00 am. Frankly, the worst part of the whole experience for me is that I don't tolerate narcotics well at all. I know morphine makes me throw up, and I guess Norco is a close enough cousin to have a similar effect. By this time, I was feeling pretty green, but a dose of Zofran helped enormously. Then, I just had to wait around for several hours while they did all the planning for the actual treatment. I had packed the iPad and earphones, planning for my husband and I to watch movies while we waited, but alas, I didn't realize I wouldn't be able to wear my glasses with the headgear! Here is my attempt to balance them on the contraption. Total fail. So, my amazing husband/caregiver Jason and I just sat around and chatted for a few hours. I got used to the headpiece fairly quickly, and it soon just felt like I was wearing a very heavy hat. 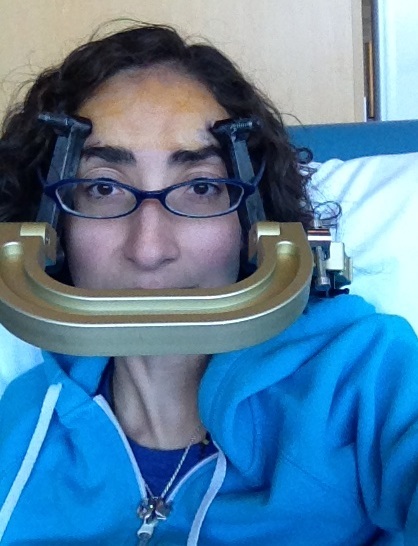 At noon, they had me take a dose of dexamethasone, a steroid to reduce any swelling from the radiation to my brain. The treatment was scheduled for 1:30 p.m., so at 1:00, they had me take another Valium and norco. By the time they wheeled me back for treatment, the duo was kicking in and I actually slept through the whole process. I remember them clamping my headpiece into the machine, and asking a few times how I was doing, but the next thing I knew they said, "OK, we are all finished!" They removed the headpiece and sent me on my way. By now, the Norco-nausea was pretty bad and I promptly threw up upon getting home. Yay, narcotics. I slept most of the afternoon and evening. The next day, I felt groggy and had a pretty intense headache, but I decided to go the Tylenol route (no more Norco for me!) and that actually helped take the edge off quite a bit. By Wednesday, I was feeling much more like my old self, just a bit tired, and I still have patches of my scalp that are numb, which is a bizarre sensation. I will have a follow-up MRI in January. Radiation keeps working for many weeks, so they won't know until then how it went. Fingers crossed that this is just a little bump in the road and I can keep going along with my targeted med Xalkori. I continue to marvel at modern medicine!